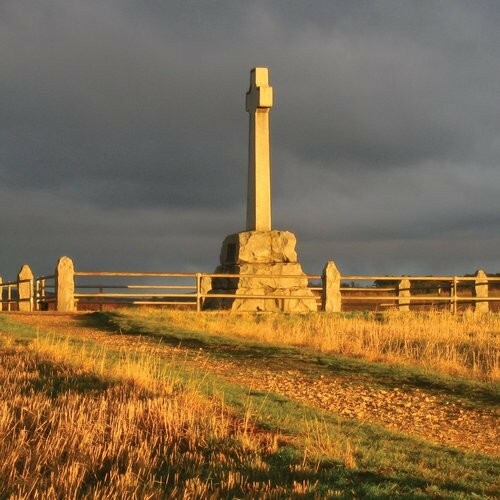 Back in 2008 a small group of people came together to consider the quincentenary of the Battle of Flodden in 2013, to debate what Flodden means, why it was such an important event in our history and who might want to have some involvement in commemorating this anniversary. A list of around 30 names of people and organisations was drawn together and a short article in the local press produced a positive response. It was the start of the Flodden 500 ‘journey’ and it was clear that the momentum needed to be maintained and encouraged. The initiators’ group engaged a Placement Student from the University of Newcastle’s International Centre for Heritage & Cultural Studies. He interviewed the 30 people or organisations on the initial database and was referred to others. By the time he had finished, the ‘stakeholder list’ had risen to about 80. The initiators group reformed into the Flodden 500 Steering Group and began to host Flodden Stakeholder events which increased in size with each event. Through these wider Flodden events the community debated and chose the sites that formed the initial (Phase 1) sites that brought the Flodden 1513 Ecomuseum into being. They also helped shape the language, strap lines and colours associated to the ecomuseum and its sites. At the same time, the Steering Group encouraged groups and individuals to take on their own ‘Flodden projects’. Encouragement and advice was provided through community events organised by Project Officers employed through generous funding from the EU LEADER programme which established the ecomuseum. Prior to the launch of the ecomuseum, a full list of the community projects was gathered and coordinated by another Newcastle University student. Once again a list that began with some 30 projects swelled under investigation and by the end of 2011 around 90 different ‘Flodden projects’ had been identified. The Stakeholder list had also continued to expand to over 300 names, ranging from large organisations to individually interested local residents. It has been a real privilege to see how the quincentenary brought about a resurgence of interest in this important moment of Borders (and national) history. No one party or interest group has a larger claim over our shared heritage than another. Within the Flodden community large public authorities or small community groups have been equally as important as each other – perhaps a rare thing in today’s world. Some common themes emerged. Interest in advancing archaeological knowledge of the battle, or researching documents and archives, or improving the opportunities for teaching our children about Flodden or (by no means least) expanding the number of sites within the ecomuseum (from the initial 12 to 41 – all in some way connected with the story of the battle) were fused together into an application to the Heritage Lottery Fund for a four-year project covering ‘all of the above’. The complexities of applying for, and running, a four-year project that covered material and sites in both Scotland and England were taxing, but the HLF have been exceptionally helpful and understanding of this. The production of this publication is the opportunity to celebrate (and we use the word advisedly) all the volunteer effort, the staff effort and the ‘in-kind’ support from many parties that has gone in to the last four years. We are truly grateful to everyone who contributed, whether scientifically, musically, artistically, educationally or through any other way towards a proper commemoration of Flodden, 500 years on. We hope that ground has been broken, and some facts established, or even some myths broken. It has all been possible through the financial support from LEADER and the award from the Heritage Lottery Fund.